The Coastal Maine Botanical Gardens features a "Garden of the Five Senses." 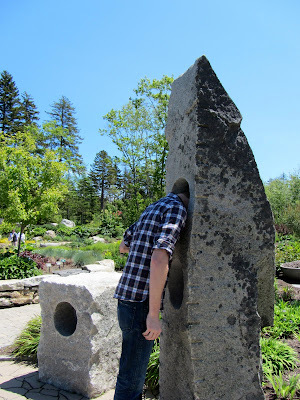 For the auditory portion, they have these large "sound stones" where you place your head inside a hole in a rock and listen to the humming. It's supposed to be quite soothing. Look how relaxed Erik is.